‘Star Trek’ Actor William Shatner Boldly Talks a Little $#*! William Shatner'snew TV show may not be taking him to the final frontier, but the"Star Trek" actor is set to take the helm of an original comedy thatpremieres this week. Shatner, 79,is the star of the new show "$#*! My Dad Says," which debuts Thursday(Sept. 23) on CBS. The sitcomis based on the popular Twitter feed of author Justin Halpern who, after movingin with his parents, used the micro-blogging site to record his father's amusing,but often expletive-laden and politically incorrect, observations and advice. Halpern'ssuccess on Twitter led to a book deal with HarperCollins. The book, titled "Sh*t My Dad Says" was published in May andquickly became a bestseller. Shatner willstar as Ed Goodson, the blunt and opinionated father of Henry, played byJonathan Sadowski. Shatnerhimself uses Twitter, posting updates under the name"WilliamShatner." "It's a mystery to me what people will think,"Shatner wrote in a recent post. "Can't wait to hear your thoughts!" According tothe show's official CBS website: "When Henry finds he can no longer affordto pay rent, Ed reveals a soft spot and invites Henry to move in with him.Henry agrees, knowing that the verbal assault will not abate and now there willbe no escape. Describing their father/son relationship is tricky, but Ed willeasily come up with a few choice words." Among hismyriad roles on the stage, television and silver screen, Shatner isprobably best known for his portrayal of Capt. James T. Kirk in the original "Star Trek" TV series that ran from 1966 to1969. Shatnerreprised the role in seven feature films in the 1980s and 90s. He has also pennednumerous science fiction and autobiographical novels, directed films, starred in commercials andappeared in many other television shows as both actor and host. This summer,Shatner hosted the William Shatner 20th Annual Hollywood Charity Horse Show toraise funds for various charities for children. 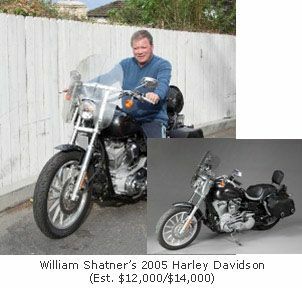 He also auctioned off hisHarley Davidson motorcycle and other personal items as part of a larger Star Trek-themed charity auction in Las Vegas in June. "$#*!My Dad Says" debuts Thursday, Sept. 23 on CBS at 8:30 p.m. EDT (7:30 CDT).Check local listing.